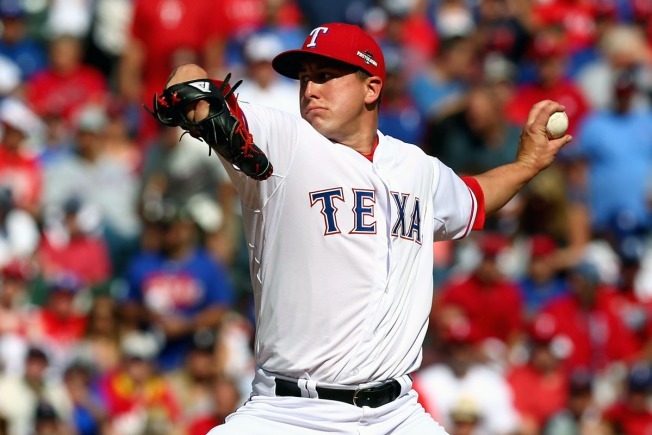 Derek Holland has a lot of potential. We all know that. It's just been a matter of harnessing it and maximizing it for the veteran lefty, who still, at times, acts like a 22-year-old rookie. Many have tabbed Holland as the most important piece to success for the Rangers this year as he'll be counted on to be the No. 2 starter until Yu Darvish makes his season debut sometime in May or June, and even at that point, we're not sure what to expect from Darvish coming off Tommy John surgery. But Rangers radio legend and Hall of Famer Eric Nadel has his own thoughts on Holland in 2016, and they tie directly to new pitching coach Doug Brocail and his mental approach to the game. "I have this theory — which is just mine — that Doug Brocail is here, in large part, to turn Derek Holland into Madison Bumgarner," Nadel told The Afternoon Show on 103.3 FM this week. "It's all about the mental approach, and the mental toughness, and Derek being 'too nice a guy.' Doug Brocail may be the guy to turn all that around. Assuming Derek is healthy, and assuming his finger is healed up, and his knee is healed up, and his shoulder is healed up, I anticipate him getting off to a great start, and we'll be just fine until Darvish comes back." Woah. Madison Bumgarner, huh? That'd be quite the leap, but it'd be quite the development for the Rangers.